Thank you to Brenda Reigle, Chester Kulesa, and Linda Bolla for their contributions to this week’s post. Although I’m writing this on Tuesday afternoon, I am fairly sure that by the time it posts on Friday, I will have eaten a significant amount of turkey and “fixins,” watched parts of several indistinguishable (to me) football games, had some laughs with my niece and nephews, and raised a glass to my late father, who would have turned 79 this Thursday. My thankfulness for my husband, mom, brother, sister-in-law, and the three kiddos will, I hope, have been expressed, and I’ll have had time to catch up with the extended family members I see mostly on holidays. A pretty typical Thanksgiving. I hope that you had a peaceful, warm, and delicious day as well, and that you were able to spend time with those you love. And since today is the shopping day of all time, don’t forget to include your favorite Trails of History museum store in your Black Friday rounds (site schedules vary widely this time of year, so please check ahead) or visit them tomorrow on Small Business Saturday. We thank you for your support. In the spirit of Thanksgiving, here’s a Trailheads buffet of goodies—no calories, no fat, no dishes to wash. Enjoy. The Lumber Heritage Region (which includes the Pennsylvania Lumber Museum) has just announced the results of their 2010 Photo Contest (one of the winning photos features the Lumber Museum’s Shay Locomotive). A slideshow of the top entries is available here. PHMC/Anthracite Heritage Museum, photo by John Horgan, Jr.
Environmental art pioneer Patricia Johanson, working with Marywood University in Scranton, is creating Mary’s Garden, an art and environmental restoration project that will also be used as outdoor classrooms. Johanson conducted some of her research for the mine reclamation project at the Anthracite Heritage Museum; her online article on the project (which will appear in print in the next issue of Landscape Architect and Specifier News) includes several images from the museum’s John Horgan photography collection. Anyone interested in researching (or simply learning more about) Elizabeth Graeme Fergusson may want to visit Graeme Park’s Facebook page, which recently posted a number of links to digitized versions of correspondence and commonplace books written by, to, or about her. For example, Dickinson College has digitized the 1787 Commonplace Book, written by Elizabeth for Annis Stockton. 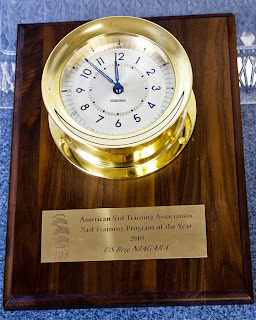 Finally, congratulations go to our colleagues in Erie—the U.S. Brig Niagara has been awarded the 2010 Sail Training Program of the Year award by the American Sail Training Association (ASTA). Captain Wesley Heerssen has been honored for his dedication to preserving and teaching the art of sailing, something that everyone associated with the Niagara takes seriously. For more on this award, check out The Ship’s Log, written by Chief Mate Billy Sabatini, or Erie Blogs. Welcome to Short Attention Span Theater, Trailheads edition. 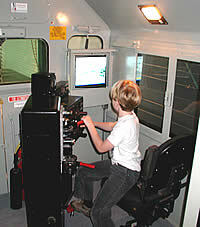 Thanks to Tom Bresenhan and Cindy Kirby-Reedy for their contributions to this week’s post. On Sunday, Nov. 7, the Pond Building at the Joseph Priestley House was rededicated following an extensive refurbishment to make the building more accessible and useful for public programming. Originally built in 1926 to complement the Priestley House as a museum, the building is named for George Gilbert Pond, who purchased Joseph Priestley’s mansion in Northumberland at auction in 1919 to save it from demolition. A silent film of the 1926 dedication ceremony was shown (with live narration by PSU emeritus professor of chemistry Roy Olofson), and Joseph Priestley reenactor Ron Blatchley demonstrated several chemistry experiments. To read more about the Nov. 7 program and the history of the Priestley House as a museum, click here and here. From the “you never know what will happen when you nurture a kid’s love of history” department, Landis Valley Village and Farm Museum was recently invited to install a small (one secure case) exhibit at the Harrisburg International Airport. Stephanie Gehman, marketing manager for HIA, attended summer camp at Landis Valley as a youngster, later volunteered and served an internship in the museum’s collections department, and continues (along with her husband Hans) to help out at events. Some 3,500 people each day pass through the baggage claims area where the exhibit is located, so it’s an opportunity to make visitors and locals more aware of the museum. Stephanie Fisher Gehman, HIA Marketing Manager, and Bruce Bomberger, Landis Valley's Curator, with a wooden drum that would have been part of a water-powered flour mill. 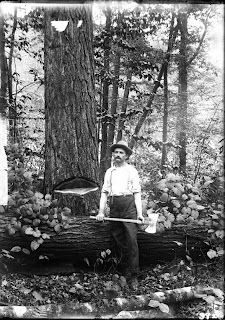 This weekend (11/21) the State Museum of Pennsylvania debuts a new temporary exhibit, “Wood on Glass: The Lumber Industry Photographs of William T. Clarke.” Clarke (1859-1930) spent a number of years in north-central Pennsylvania during the late 19th and early 20th centuries photographing people and places, documenting lumbering activities and their effects on the landscape. The exhibit, which will be up until May 2011 (and then will be available to travel), features prints from about 30 of the 450 known glass plate negatives remaining of Clarke’s work. 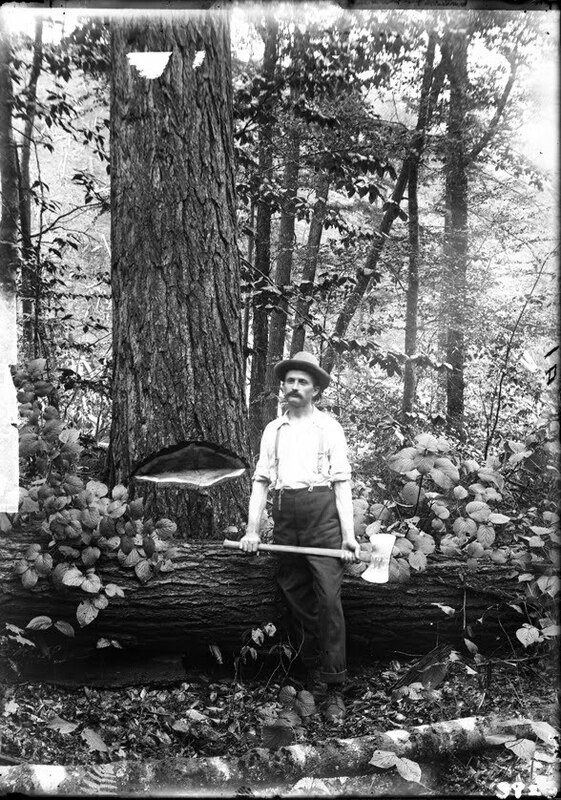 Many of these come from the Pennsylvania State Archives holdings of the records of the Department of Forests and Waters (which no longer exists as such). The exhibit also includes artifacts from the State Museum and the Pennsylvania Lumber Museum. 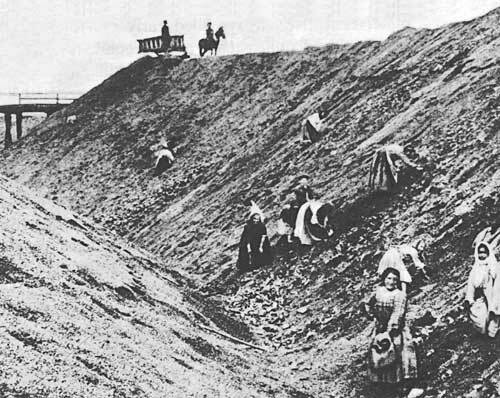 For more info on Clarke and his work, click here. If you’re in the Harrisburg area, come on down tomorrow (11/18) or Friday from 10 am to 3 pm to the atrium of the Commonwealth Keystone Building for the 5th annual Holiday Marketplace. Organized by the Pennsylvania Heritage Society and sponsored by PSECU, the marketplace features gifts and holiday selections from sites on the PHMC Trails of History and several partner agencies. Purchasing handcrafted, unique or signature items from our museum stores is a great way to show your support for the Trails of History (of course, cash donations are a lovely gesture, too). The Holiday Marketplace brings together a fine collection of sites all in one place: Ephrata Cloister, Landis Valley Village and Farm Museum, The State Museum of Pennsylvania, Railroad Museum of Pennsylvania, and Somerset Historical Center. You’ll also find representatives from the Pennsylvania Artisan Trails, State Parks, and the Capitol Preservation Committee. Tony’s Café at the Keystone will be on hand with free samples (not sure of what, but I’m sure it will be tasty) while supplies last. See you there! I’m posting a day early this week, Trailheads, in order to convey my thanks to PHMC staff and volunteers, visitors, and supporters who are serving now, or have served in the past, as members of the U.S. Armed Forces. I also wish to express my gratitude to those of you who have family members serving—waiting anxiously at home while your loved ones are away is no small contribution. According to the website of the state Department of Military and Veterans Affairs, there are some 1 million veterans in Pennsylvania. That’s about 8% of the state population. And that doesn’t include (at least I don’t think so) the number of Pennsylvanians currently on active duty—I’m sorry I wasn’t able to find that figure (if anyone out there knows it or knows where I can look it up, please leave a comment). There many ways we honor Pennsylvania’s veterans and active duty military on the Trails of History—for starters, active military and their immediate families are admitted free of charge to all of our sites (or receive reduced admission to special events). 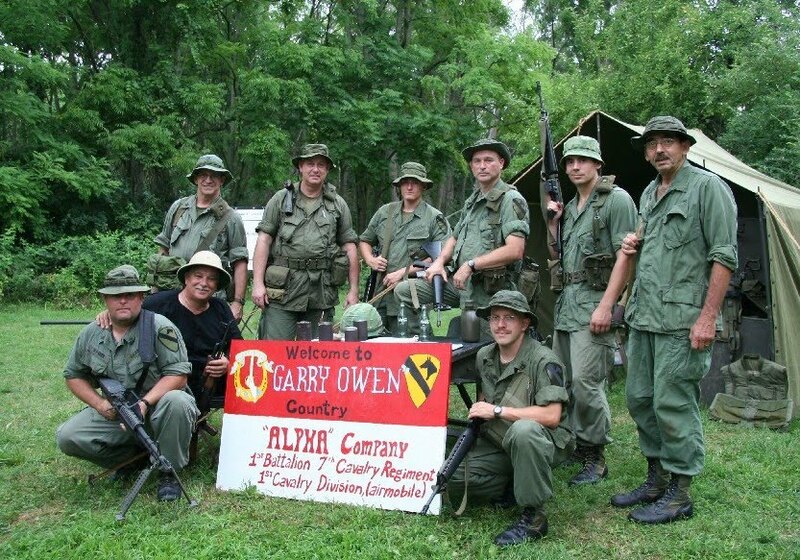 Many of our sites recount the stories of people who entered military service during various points in our nation’s history. 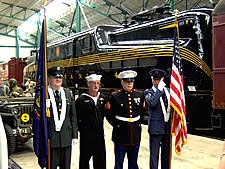 Most notably, these are stops on the Military History Trail, but others do so as well, during special events or exhibits. Even Trailheads has gotten into the act, including a guest blog post last year about efforts at Erie Maritime Museum to recognize a Medal of Honor recipient. Whether they have served in the military themselves, or have family members serving, many of our staff and volunteers say thank you to our Commonwealth's veterans through their work on a regular basis. And I am grateful for that. If you drive along Route 6 in Potter County, between Galeton and Coudersport, you’ll notice something new across from Denton Hill ski area. Or actually, several somethings. 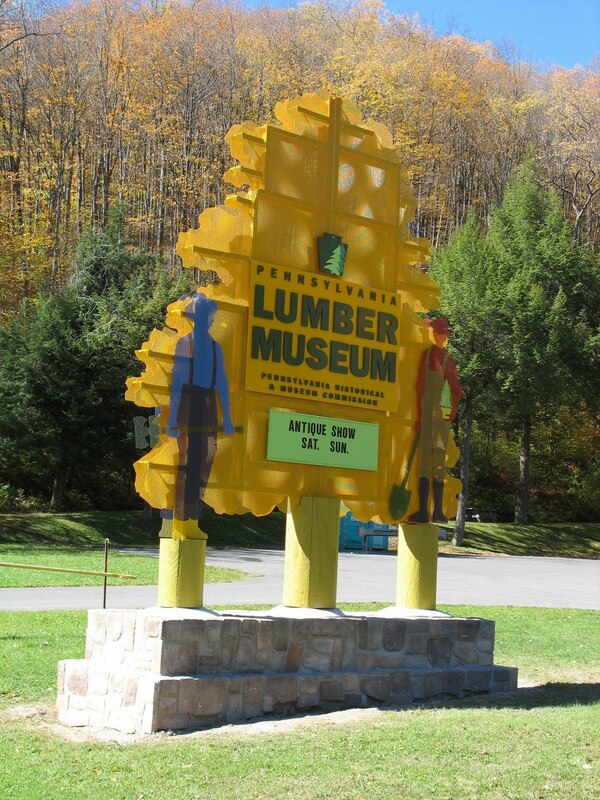 There’s now a cheerful, more colorful entrance sign letting visitors know that they have arrived at the Pennsylvania Lumber Museum (which reopens for the season in April). 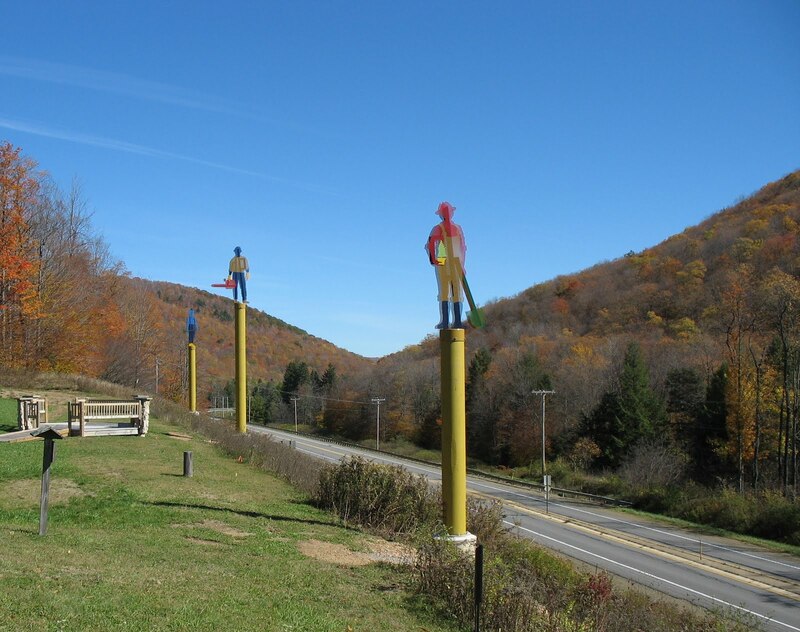 But in a bit of whimsy not often found on the Trails of History, you’ll also see something that we affectionately call “People on a Stick.” Designed to evoke workers from lumber history, the figures are also meant to help attract the attention of potential visitors (keep both hands on the wheel, please) approaching from Galeton, Wellsboro, and points east. I’m told that a contest to help name the people on a stick is in the works—watch this space for more details. Happy Wednesday. If you want an extra hour of sleep this Sunday, be sure to set your clock back Saturday night, as Daylight Savings Time comes to an end. Several weeks ago, I wrote a post about tours at historic sites and put up a poll asking you to vote on your preferred way to visit a historic house or historic site. The poll gave you one choice from among “guided tour,” “self-guided tour with brochure,” “self-guided audio tour,” or “other.” Granted, at many historic sites on the Trails of History and elsewhere, it’s not an either/or situation—often, a guided tour is required for some parts of the site and you’re self-guided for other parts. But for simplicity, I limited your choices. The poll is now closed, but I’ve left it up so you can see the results (to the right of your screen). There’s some data out there (not to mention a fair amount of anecdotal evidence) that suggests these responses (which I have to emphasize are VERY non-scientific) don’t reflect how general museum goers feel. That is, it appears that more visitors want to explore on their own and ditch the guided tour if they have a choice. They still seem to want options for getting more information, however, including brochures, audio tours, and interaction with knowledgeable staff. So, why the discrepancy in these responses? Hard to say, but I suspect that many Trailheads readers are hard-core history museum visitors. Personally, I still love a good guided tour, although I’m coming around to the idea of a good audio tour. I’ve experienced some high-quality audio, including the recent cell phone tours coming on line at Trails of History sites. The important thing, in my opinion, is that we be open to what our visitors want, work with the resources we have available, and continue to provide security and care for the historic buildings and collections we hold for the public. I’d be happy to hear some comments from readers about your further thoughts on this.